Sometimes I discover the most amazing stories from my FB friends who are currently living in a country of the former Soviet Union or are back home after surviving living in the former USSR. Check out this YouTube clip that shows real footage of Lenin and has interesting graphics. It definitely has a point. I have another funny one done by Ben Kling called Dictator Valentines which also include Trotsky and Marx. They are funny but this will have to do for now. Look them up yourself. 18. Victims of trafficking often try to escape, but they are caught and severely punished. Some girls try to commit suicide. 20. Saule (not real name) left home at 16 because of constant arguments, fights and alcoholic parents. I came to Astana together with my friend. This one woman came up to us and offered us work. At first we didn’t understand what kind of work it was. When we got to the apartment, she told us what we’d be doing and offered us to stay the night and we could answer the next day. The next day we said that we weren’t interested and she answered us ‘I rented an apartment for you, fed you, and now you have to work off your debt.’ Then they just wouldn’t let us leave. One girl costs 5000 tenge/hour and one girl could serve anywhere from 5 to 20 clients a day. They beat us often. Once we had worked all night until morning but the clients wanted to extend their time until lunch. We refused. Then the pimps came, took us out into the Steppe, and beat us. Our pimp was a young 23-year old girl who herself had been a prostitute and our handler was an 18-year old boy. 21. 17-year old Lena has a psychologically-developed mind corresponding to that of a 10-year old child and was impregnated by a client to whom she became attached when she was a slave. She considered him her favorite person. Girls with mental illnesses sometimes only need just a hint of affection or some trinket and they become attached to him and believe him unconditionally. “When I lived in a dormitory for former orphans, a car came by and took two of our girls. The girls ran away. When I came out of the dorm once, I met a woman named Tanya who offered me to work in her café. I went to the location and Tanya said that I’ll be a prostitute. Girls who refused were severely beaten and even set one on fire. 22. Vera is mentally retarded, finished only one grade and can’t read or write. She can’t explain anything by herself. According to Anna Ryl, a man helped her by telling the police. They beat her in the brothel. Before that, Vera lived with alcoholic parents who sold her into slavery. When she first came to the center, she couldn’t put two words together. 23. 17-year Saltanat left home because of numerous fights. Together with her friend, she left for Astana to find work, where she fell into the hands of traffickers. 24. Veleriya is raising a year-old daughter. 26. In addition to commercial slavery, the Komek Center all works with victims of labor slavery. 27. “Two years ago, three people came to us who had been held anywhere from 4 to 15 years at the wintering grounds of Karakuduk in the Shetskiy District of Karaganda Region. Ukrainian citizen Tatyana Tverdokhebova was a labor slave victim from 1995-2009, Vladimir Solomatin from Temirtau was in slavery from 2005-2009 and Oktyabr Lee from Karaganda was held from 1995-2009. Oktyabr was the only one who stayed in the center. He has had poor hearing since childhood. After his release, due to inhumane conditions and poor food, he had to undergo four operations. “I worked on this farm since 1986,” tells Oktyabr. “After the Soviet Union collapsed, there wasn’t anywhere to go and farmer Tursunbek Akzhunusov asked me to help him on the farm and I agreed. At first I was treated well, ate together with the owners, they weren’t rude and didn’t hit. He promised a lot of money, but never paid. The work was hard – I had to tend to almost 900 sheep and take care of each animal and clean the barn. When I started getting older, they understood that they I didn’t have much good to me and started to treat me like an animal. Sometimes Tursunbek would hire workers and pay them 20,000 tenge but all that was left for us were beatings and scraps. Tatyana showed up on the farm in 1995. She was a good worker on the farm, but the owners didn’t spare her and beat her while Tursunbek’s son was raunchy with her, raped her and did bad things to her. She begged to go home but they only answered with beatings and cut rations. 28. “In 2005 came the last of us, Volodya. Not a very tall man but a very healthy man. He tried to escape but was caught and was beaten like a dog, tied to a horse and dragged around in circles. The shepherd had seven sons and they all beat Volodya. I told them, ‘God will punish you for doing that, you can’t treat people like that…’ but they kept beating him while the 60-year old farmer, seeing that Volodya was completely battered, laughed, saying, ‘What happened, did you fall hard?” The beatings left him disabled for life. Most recently, the Komek Shelter received three victims of trafficking: a 35-year old woman from Tajikistan who is a victim of labor slavery and two minors, a 13 and 14-year old. The children were abducted and exploited in commercial slavery. Human trafficking is a billion-dollar industry and a global problem in the 21st century, still existing in practically every country around the world. Sexual exploitation and human trafficking in Kazakhstan have grown to appalling levels in recent years. Cases of slavery don’t happen just in the far off corners of our country, but also close to home, even in trouble-free Astana. For three years, the Komek Rehabilitation Center has been helping victims of labor and commercial slavery, protecting their rights and providing medical and psychological care. 1. Five years ago, the center’s director Anna Ryl didn’t have thoughts of social work on her mind. 2. The Komek Center was created with funds from Korgay Astana under an initiative by the Ministry of Justice in 2009. The center is a non-profit organization which offers specialized services to victims of human trafficking. From April to December of 2011, 58 people have passed through the center’s doors. 4. According to the annual quota, the shelter is designed to take in 24 people a year. Rehabilitation takes 6 months and can be extended to 9 months as required and at the request of the victims. 5. 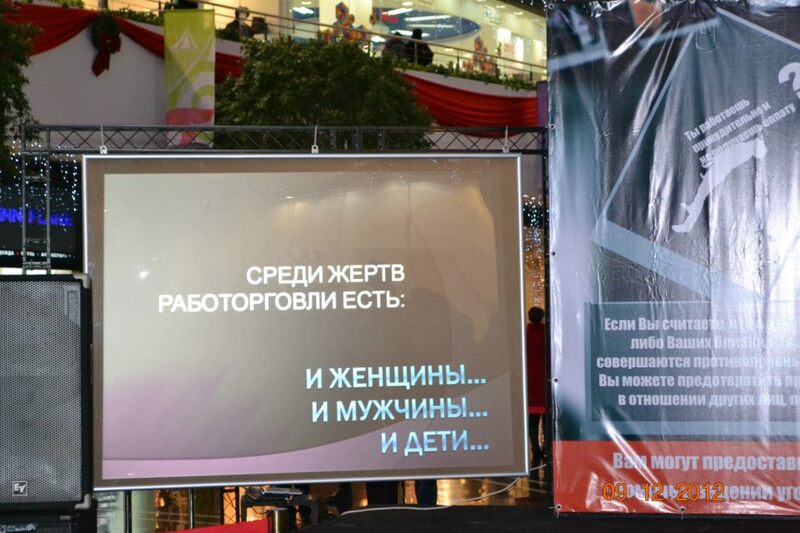 According to UNICEF research done in Kazakhstan, sexual exploitation is most prevalent in teenagers between the ages of 15-17. When interviews by journalists, most girls request that their faces not be shown as most often relatives are not aware of what has happened to them and they themselves try not to talk about it much. 9. Within the center, girls can get help from doctors, lawyers and psychologists. There are various additional courses as part of the 6-month rehab program. Girls can take classes on hair and nail styling or cooking. 11. Creative development is also a part of rehabilitation. The author of this piece already finished the course and now has a full-time job. 12. The shelter has certain rules that the girls has to follow: clean up around the living area, help with chores, no swearing, no raising your voice, provoke arguments, leave the territory without written permission and accompaniment of a center staff worker, or use cell phones. 15. “Most victims of commercial slavery are girls from disadvantaged families or girls with mental illnesses from orphanages. Mentally handicapped girls are especially in demand and are more expensive. These girls are gullible and aren’t aware of what is happening to them and don’t really resist. One of the highest-profile criminal cases, and the only time to date when exploitation in this category of victims, was successfully proven not long ago. Over two years, four traffickers removed 15 girls from Temirtau and other villages in the Karaganda Region. The traffickers went around the villages, looking for mentally retarded girls. They drugged the girls with Diphenhydramine [a hypnotic sedative], moved them to Astana and sold them. The traffickers were caught, convicted, and sentenced to 4-12 years in prison. All 15 of these girls underwent rehab with us. According to the girls, they were taken to an apartment, beaten, raped and forced to serve up to 10 clients a day. The following is something I read on Facebook where I’m getting most of my news these days. I’m busy working on a book so I am feeling isolated from the rest of the world. That’s why I thought I would share these photos because I am so encouraged by people DOING something. 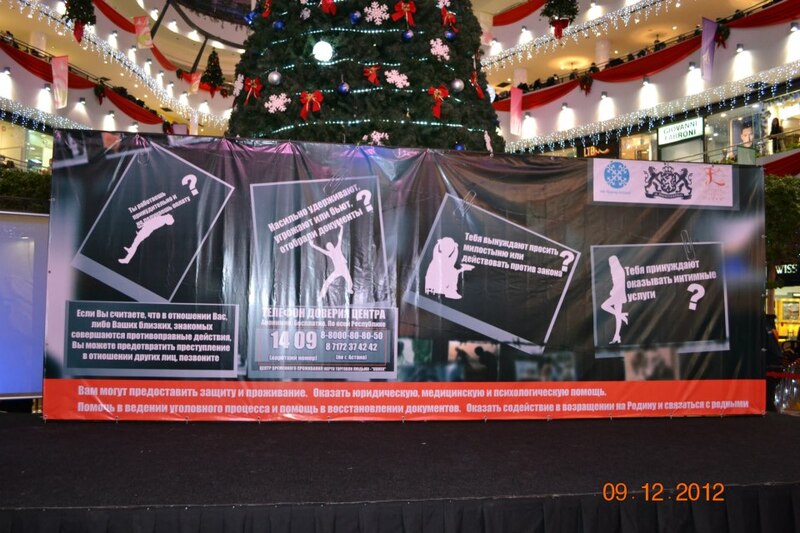 I’m glad that expats continue to be pro-active by raising awareness in Kazakhstan about Human Trafficking especially in Astana. 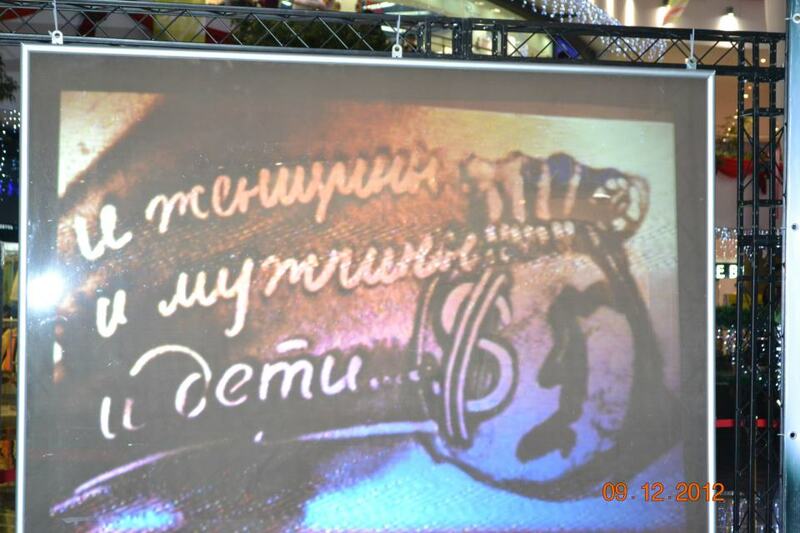 My Russian isn’t that good but I can read what was projected on the screen and understand that people are made to work as slaves against their will for the dollars generated: ladies, men and children. THIS MUST STOP! Awareness and knowing where to go to get help is part of the solution. How ironic that this show was staged to attract attention from shoppers in Khan Shatyr with dancers. It was only seen by the elite among those in Kazakhstan. Unfortunately, the warning should be sounded loud and clear in the Central Asian countrysides where the vulnerable people are, desperate for a job. They will believe any lie given to them about moving to the BIG CITY! Here are my New Years resolutions for 2013 and a poem for my readers. I pray Kazakhstan, the country I love after my own, would embrace this same resolve about forgiveness, trust and gratitude.